We’ve all seen those TV shows where we get a glimpse into a bride’s wedding dress shopping experience. She tries on what seems like hundreds of dresses and somehow by the time the show is over, she still hasn’t found the perfect one. Shopping for a wedding dress can be one of the most stressful tasks for a bride. With the range of styles, cuts, fabrics and embellishments, it’s just so hard to find the look that truly speaks to you. 2015’s Bridal Fashion Week showcased thousands of dresses by top designers who set the trends in bridal fashion. The bridal runway show is a great way to view a ton of dresses in a short amount of time and can help you decide what style gown you want to try on. 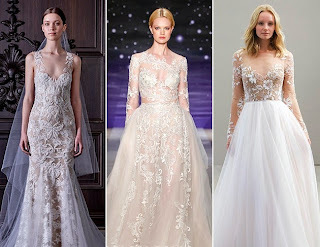 While most brides go for the traditional white gown, this year’s Bridal Fashion Week showed us that there are new, modern wedding dress styles too breathtaking and exciting not to consider! Check out these wedding dress styles that stole the show this year. Bridal wear took, literally, an adventurous plunge with the deep cut necklines that made an appearance at this year’s Bridal Fashion Week. The deep v cut beautifully accentuates the neck and collar bone area while still holding everything else in place. While plunging necklines did make an appearance in last year’s fashion week, this year’s take on the trend was a lot less severe, softer and modestly revealing. Sheer sleeves and fabrics were major this year. The transparent cloth allows the beautiful stitching and embellishments of the dress stand out, creating an extremely elegant neckline. The fabric lets bride skip out on the necklaces and jewelry since the eye-catching designs dress up the upper body beautifully. Times have changed in the wedding world and wedding dress designers have definitely taken note of that. Modern white pant suits hit the runway as an alternative to wearing the traditional gown. Designers showcased a selection of fitted blazers, cropped pants, wide leg pants and everything in between. 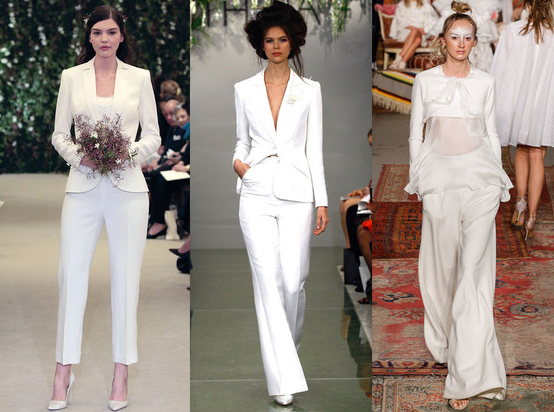 This just goes to show that a bride can look beautiful in anything she wears on her wedding day! Details have always been big when it comes to finding the perfect wedding dress. This year’s show featured a variety of gowns with perfectly placed feathers for a wonderfully flattering and whimsical wedding day look. The playful detail wasn’t just restricted to the bodice or any specific part of these designers’ gowns. 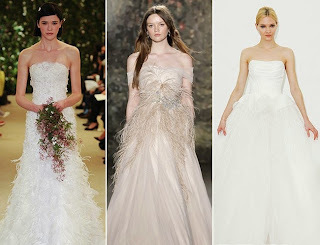 Feathers were at the top of the gowns, the waist, the bottom and the train. 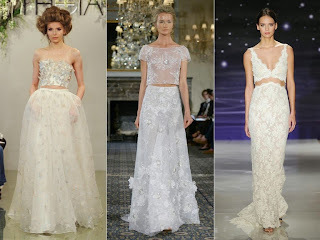 Arguably one of the most eye catching trends this year was the introduction of bridal crop tops. A variety of designers had models walk down the runway exposing their mid drift in beautifully embellished tops and skirts. There’s no denying the fact that a two piece wedding gown would be easier to put on and take off and would be a lot cooler than heavy, full coverage dress. We will just have to wait and see if this trend catches on as summer wedding season approaches. 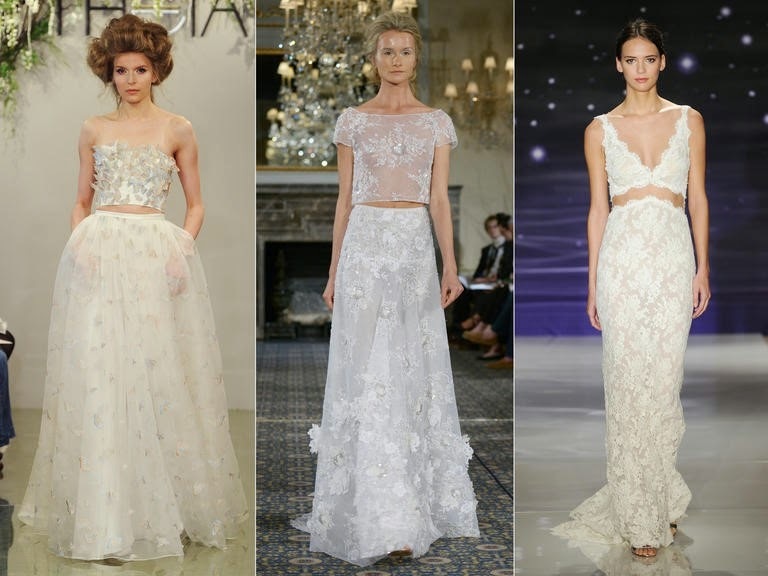 What were your favorite looks from this year’s Bridal Fashion Week? Share with us in the comments! Wedding is always one of the hottest topics in India, becuase of the high amount of money it takes to buy bridal jewellery.